Or somewhat painful; because I start to reflect critically on what I am doing and why. Such was my state of mind in November 2013 when I boarded my flight to New York to participate in Jim Clark’s World Technology Network Summit. Two years earlier, after the sale of my software company to Adobe, I had started an NGO in the sustainability space. The foundation, the Kayser Forum for Sustainability, had completed several projects by then, but the main one was a three-month expedition in Ecuador and Peru, named La Ruta del Agua. A team of explorers and filmmakers had traveled the “Path of the Water”, from the glaciers of the Andes, deep into the Amazon Basin, a region which is semi-autonomously governed by local tribes. 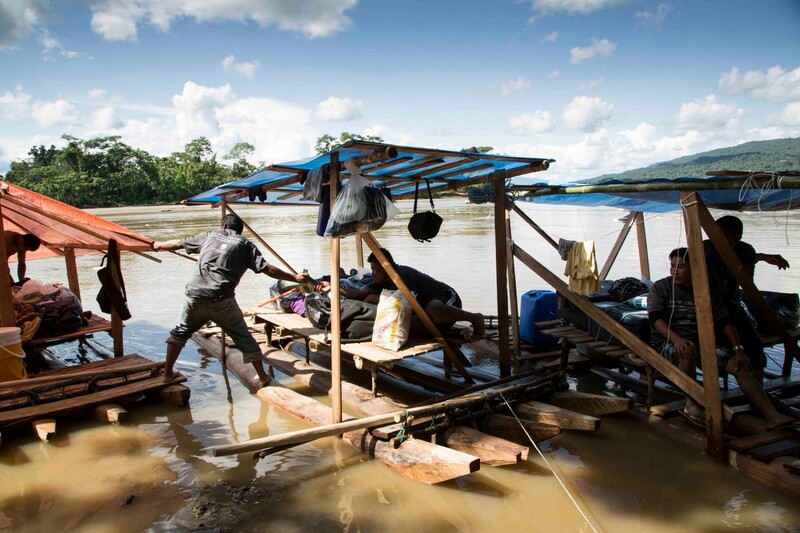 The team collected water samples, documented the flora and fauna and trained the indigenous Shuar people in the use of video equipment to document environmental destruction and human rights abuses. Two years later, sitting on my Lufthansa flight to New York, I should have been satisfied. I should have been proud of what my organization accomplished, but I couldn’t help but feel, that we did not really make enough of a difference to the planet to justify all the energy, time and money we spent. Boy, I thought. This stuff is hard. You want to do the right thing, you want to find the biggest lever, but you honestly don’t really know where to begin. There are so many global issues, so many different approaches and so many people working on something already. So you just go ahead and learn as you go. Just like everyone else. With these thoughts on my mind, I went to the conference, which was a great distraction in the positive sense. The WTN Summit is in an intimate setting, with speakers and content that can otherwise only be found at more prominent events like TED. The conference was split into two parts — the regular speaker and awards program, and an interactive session with help of the United Nations, where the conference attendees brainstormed on the problem of world hunger. While chairing a session about the elimination of food waste in industrialized countries, I started to notice a pattern: Many of the solutions that the team brought up, all sourced from their own communities, looked similar, but they were all slightly different. It became clear that they had all been independently developed in parallel. In other words, people everywhere are spending a lot of time to come up with solutions that are similar to ones that somebody else has already put to work somewhere else. They repeat the same mistakes and learn the same lessons all over again. So the issue isn’t a shortage of ideas — it is a lack of flow of information. What is missing is an effective way to share, discuss and to rate solutions to global challenges, so that people can actually learn from each other. After the conference, on my flight back home, I started to connect the two ends of my thought process: I realized that a collection of best practices was exactly what I was missing when I started my foundation. How do you actually begin the work on a issue that you care about? What have other people tried successfully or unsuccessfully? Who has done what and how do I contact them? What is the biggest lever I can push? But let’s back off a little. Isn’t there enough information out there already? Are there not search engines to connect all the dots? Isn’t the idea of another platform an outdated concept in a world of big data? There is of course the one great example of a global knowledge-sharing platform that everyone uses on a daily basis: Wikipedia. Imagine a world without Wikipedia. A world, where all the content is still available on the internet, Google exists, but Wikipedia has not been invented yet. I would challenge you to actually try out what happens when you research a fact in such a world. It is a very tedious experience. When you search for knowledge on the internet, the results are fragmented, unreliable and tedious to evaluate. Fortunately, Wikipedia exists, and there is a reason it oftentimes shows up first on a web search. Jimmy Wales with his team of volunteers and ultimately “the crowd” have collected a large part of the world’s body of knowledge and made it accessible in a consistent and structured way. There is no doubt that Wikipedia is by far the best resource for accessing general factual information. So, why can’t I use Wikipedia to solve world hunger? Wikipedia is a collection of facts, each article is a summary of the body of knowledge for a topic. A fact is either correct or needs correction, there’s not much wiggle room between true or false. Solutions and best practices are different. They are contextual. Some may work here, but not there. There may be different solutions for the same problem and some may work better, or worse, depending on many factors. This is clearly not the static knowledge that Wikipedia reflects. Wikipedia may be able to describe a problem very accurately, but it will take a different approach on a different platform to actually help solve them. So, instead of a fact sheet, we need a cookbook full of recipes. Like a cookbook it will contain something for every taste and occasion. Somebody’s favorite dish might not be for you, just like someone’s best practice might not work for you. It may still work great for somebody else or in a different context. But if you look at the world’s best recipes, chances are, you will find something that you like. And if you find something is missing, maybe you will be able to improve on it, creating a recipe that fills a new niche — or one that everybody likes better than the original. Also, very importantly, a cookbook lets you discover dishes that you did not know existed. In other words, a platform that presents recipes for solutions will let you discover things that you may want to tackle. Why spend time and money on a bad dinner, when there is much more you can do with the same ingredients? For a year, I thought about this idea. Whenever I raised the topic in conversations, everybody was excited about it. Many wondered, why it didn’t exist yet and why nobody was building it. Somebody should give it a try — somebody should build it. At the end of 2014, I finally decided that this person could be me; so I held a talk at Jim’s next conference, where I described the platform, committed to build it and gave it a name: Eleza.org. Eleza means to clarify or to explain in Kiswahili, a language spoken in large parts of Africa. It is also a tongue-in-cheek reference to Joseph Weizenbaum’s early experiment of computerized natural language processing, creating a computer program that you could talk to for hours. I wanted something that was short and memorable and emphasizes that we live in a world that speaks many languages, inhabited by people from many cultures, who all have something to contribute. In terms of technology, I described Eleza.org as a mixture between Wikipedia and the ranking and commenting system that you see on many e-commerce sites. Shared content is ranked by votes and possibly helped by the crowdsourced reputation of the author. In an ideal world, the best solutions from people who know what they are talking about bubble up and the most valid comments prevail. Just like with Wikipedia, there will also have to be a certain degree of editorial control and curation. Feedback was almost overwhelming. Right after he talk, Jim Clark pledged the full support of the World Technology Network. Many people and organizations offered advice and help. Ultimately talks with Laura Bechthold and Philipp Naegelein at the Munich-based Center for Digital Technology and Management (CDTM) resulted in the plan to build the first alpha version of Eleza.org in a week-long hackathon. The topic for the hackathon centered around best practices for dealing with the global refugee crisis, a problem that is currently very close to home here in Europe. The platform clusters topics around the United Nations Sustainable Development Goals. In November 2015 Eleza e.V. registered as an official NGO with many participants from the original hackathon team as the founding members and the Kayser Forum as the first institutional member of the organization. There is no question that we are working on a project of considerable proportions. It is likely that our approach is too simple and that we will have to modify both our underlying concepts and their implementation. The prototype, at the time of this article, is still rough and bumpy from the hackathon and is still lacking essential functionality. Besides building up an attractive and functional user experience, generating compelling content is probably the biggest challenge at this stage, one of the reasons why the core teams dealing with content and community are bigger than the team working on code. After all, the genius of Wikipedia lies less in the code, but in the community behind the scenes that prevents it from descending into chaos. And this brings me to what we need now — while the founding members took the first important steps to get the Eleza.org off the ground, we now need to grow our team of volunteers to help complete the platform, to propose new problem spaces, to source and contribute content and to help with the editorial challenges and translation. All of this will require the work of many people. In other words, the future of Eleza.org depends on your participation.